The park is rather busy and noisy during the night but no one seems to care that I'm camping here. Puh! It's again a bitterly cold morning and stowing the wet tent is torture for my fingers... The rising sun however is heating up the air quickly as I'm hiking along a busy Highway towards Wenderholm Regional Park, massive trucks roaring past less than two meters away. Not an appealing feeling (there would also be the possibility to Kayak this part on Puhoi River. Might be a little more peaceful). 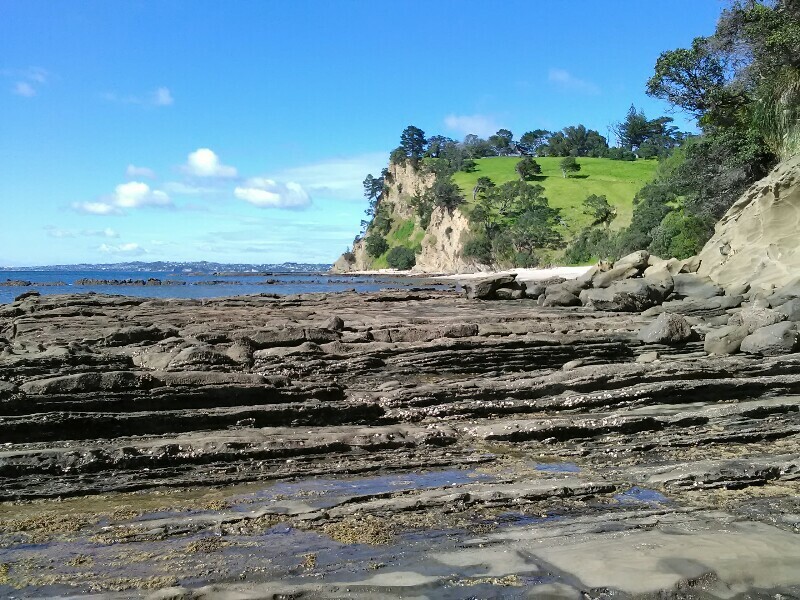 The tide is almost out and thus allowing me to hike around the cliffs almost all the way from Waiwera to Orewa. Really cool and great fun! Especially on another picture perfect sunny day like this. It's not particularly difficult to hike, still after an hour of (easy) rock hopping, the feet are happy to get some beach walking along Orewa Beach. It's shortly after midday - I text Matt to arrange the pick up, which would be in Silverdale, 8km or 1.5h away. 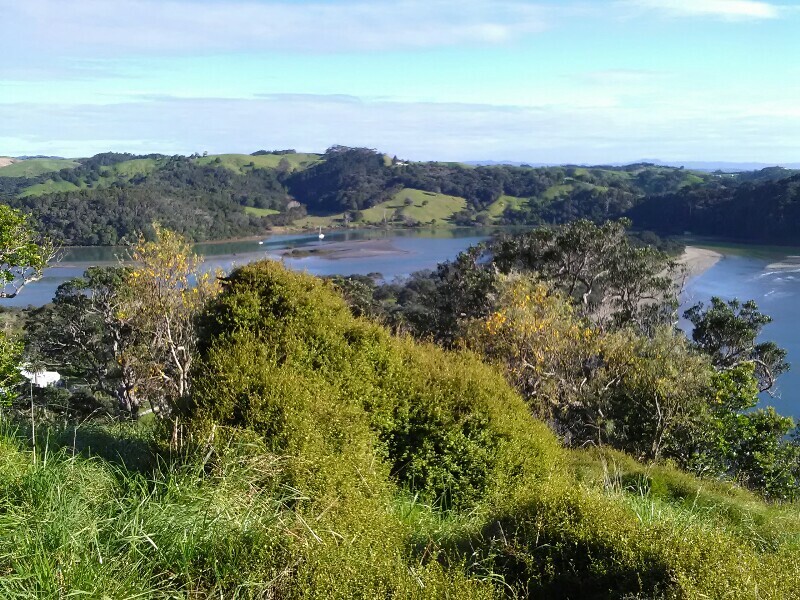 The 8km are mostly along walkways, following the Estuary, then through the massive shopping malls of Silverdale. Everything is looking brand new, with a lot of new buildings still under construction. During this last few kilometers, the nice sunny day turns into a not so good one. Showers hit me on the last few meters. Nothing serious though. Still, I'm glad I'm finished with today's hike. The rest of the day is simply amazing. Matt gives me a sightseeing tour around the area with heaps of interesting information. He's satisfying my hiker's hunger perfectly and basically lets me spend a "normal" relaxing afternoon at his place. Doing the laundry, watching a rugby game (trying to understand all the rules, not yet successful but I still got a few months... ;). I can even use the computer to finally back up all my photos and videos. Time flies and the day unfortunately ends way too soon. After the crossing, I'll try to push all the way to Auckland in the afternoon, where I should arrive shortly (yay, finally some night hiking :) anf where I booked one of the last remaining beds in the city (it's weekend...).